I also wanted to make you folks aware that the Cirque De Seraphim event was an event to support ASPCA (American Society for the Prevention of Cruelty to Animals) <3 WHICH is an amazing organization that I support. Unfortunately the event is over. But you can still make donations at ASPCA. The booth will be available at the main store soon and is also available in blue and purple. Now be careful folks don't kiss to many toads!! But I suppose you don't have much of a choice if you want to find your prince/princess. Until next time Happy Shoppings my lovelies. ^.^ Mwah! So sorry had a ferocious dragon to battle this week! But now that the beast has been safety transported back to it's home country the village is saved and I can resume my blog posts!~ Wait what?! You thought I was going to kill the dragon.... hehe nope. So today I got to feature a lovely skin from Crow and some lovely lipstick shades from THD! I also had a guest model for today's post! Yes a guest, well I'll be blessed. So thank you Lady Kimberly for gracing my humble blog with your presence. Twas an honor! We would also like to thank the King for unknowingly letting us wander his castle gardens. Extra photo today! I must not forget my song for this post, Lord of the Rings - Evenstar. 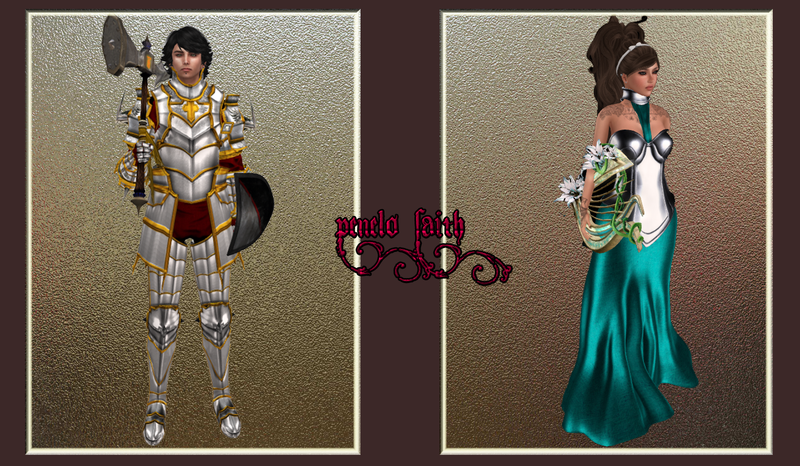 Ok ok so one more of Fantasy Gacha items. So no new designers to join my lovely family but I do have a lovely gentlemen to introduce. Here is my lovely male model -whistles - He's beautiful isn't he ahahaha... Well I am extremely excited because I hoping to be posting more male fashion items. Granted my posts will still be mainly be woman's fashion. Give a warm welcome to my Dork in shining armor. Welcoming into my arms lovingly Voss. Grins. (No he is not my lover....no we are not romantically involved but if that make's you happy fantasize away LOL) Of course I have a great love for the medieval era. My leading lady and her knight needed some suitable music.. what could be better than some Skyrim music? Felt for the above scene needed something peaceful and serene. So here's Kyne's Peace. The suite of armor also has a helm available I was going to show it off but didn't want to hide his face... least not yet. The mesh hands come with a hud so that you can either have the hands open or closed which is ideal for holding weapons. Thought for a good bit what or who she was....than there was a little tickle in my brain.... Yes indeed she is "The Red Lady" or perhaps just a Enchantress of Fire. Whatever you may think be warned. She knows how to use her dagger and clearly she is wise. No Lyrics for today's song just some erie music that may give you some goosebumps. Granted Halloween is over but I am not quite done with my costumes. Besides who said we can only dress up once a year. I will dress up whenever I please and for those of you who feel the same way, I have plenty of goodies to come throughout the year. But with a heavy heart I must say that one of my great designers (MoOh!) will be taking a temporary leave! Have no fear for one day she may come back but no worries you can still get some of her goodies for she will be designing under ZOZ. So with great sorrow way lay MoOh to rest but arisen from the ashes I am greatful to say that I was invited to join once more with the lovely designer of ZOZ. So be ready for some of her goodies come next post. If that wasn't lovely news to begins with I am also proud to introduce my newest designer Crow to my family. She makes amazing skins! So more of hear greatness to come! Remember for all you Halloween junkies. You don't need one day a year to dress up.. I mean we have 364 other days that we can do just the same. Now for our lovely song and goodies! To the left demonstrates the lovely eye shadow from BluPrintz and to the right is the Crow skin at its natural state if you don't count my added eyelashes. The eyes come with three shades per pack.